Qatar 2022: Worker abuses ongoing on construction sites? Amnesty International released a troubling report about working conditions in Qatar. It’s hardly as catastrophic as you may think, but shows continuing and partly unresolved issues for migrants. Most recent Amnesty International report “The ugly side of the beautiful game” is a worthy read for everyone. Both for those drawing catastrophic images of thousands dead and those hoping that Qatar has already dealt with all problems regarding forced labour. The 80-page report focuses on one area of Doha, where the Khalifa International Stadium and several other projects are being implemented. The organisation asked workers about their living and working conditions. Most frequent issues raised by the migrant workers regarded delayed payment, threats of no payment, deportation or denial of an exit permit. Many workers were assigned to carry out works they didn’t agree to when signing their contracts. Most of the problems were the outcome of Qatar’s kafala system, in which all migrant workers are under direct supervision of their employers. The report praises efforts by the Supreme Committee for Delivery and Legacy (SCDL), who made strides to provide good working conditions to the 2022 World Cup workers. At the same time, Amnesty International blasts the Qatari government and FIFA for – respectively – the current form of kafala and negligence in ensuring workers welfare. The Supreme Committee has already responded and it seems their response has a lot of merit. While published only now and presented to SCDL and FIFA in January, the report was carried out back in early 2015. Which means a lot may have changed since Amnesty International researched the subject. And it has, at least to some extent. SCDL confirmed that one of the companies under Amnesty International’s scope was forced to comply with worker rights, several others were even banned from carrying out any work after the SCDL found them not respecting worker welfare. Among them is Eversendai, one of the main culprits of the recent report. One thing that’s certain is that there still need to be changes in Qatar and human rights organisations won’t stop monitoring the World Cup projects. 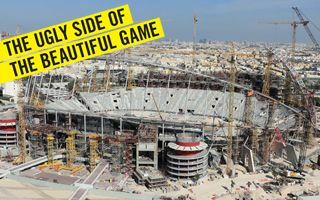 There are currently 5,100 construction workers on Qatar’s six active stadium sites, according to the SCDL. That number is expected to reach 36,000 by 2018.